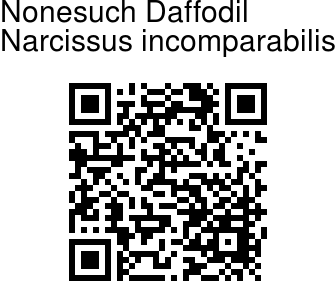 Nonesuch Daffodil is a perennial herb, 20-50 cm tall, hairless, with ovoid bulb, and 3-5 leaves, which are glaucous, 8-15 mm wide, almost flat, blunt, erect, barely equaling the stem somewhat compressed at 2 angles. Flowers are yellowish, often double, large, 4-6 cm across, odorless, solitary, almost erect. Spathe is blunt, shorter than the flower perianth saucer, with pale yellow divisions, obovate-with a short sharp point, spreading, longer than the narrow funnel tube. Crown is dark yellow, broad cut, 8-12 mm high, flared, wavy-lobed, equaling about half of the divisions. Style is beyond the little unequal stamens. 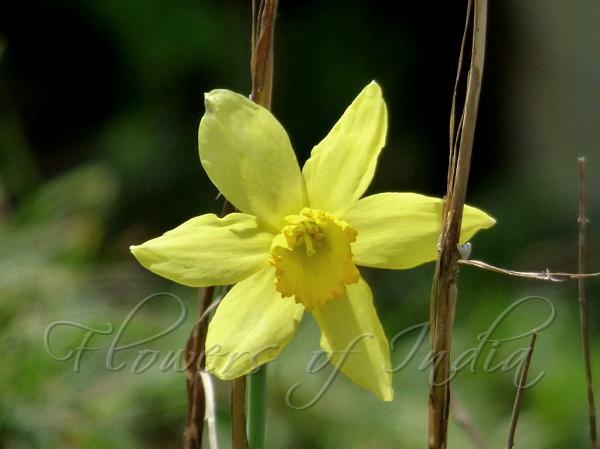 Nonesuch Daffodil is found in fields and meadows, in France, Spain, Southern Switzerland, Italy. Flowering: March-May. Identification credit: Gurcharan Singh Photographed enroute to Gulmarg, Kashmir.